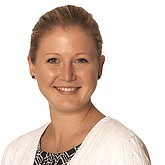 Charlotte gained a Masters degree from the British School of Osteopathy in 2010. She has varied interests including posture, ergonomics, pain science and chronic pain and enjoys treating a wide variety of clients with differing lifestyles and activity levels. Charlotte has a hands-on approach and uses a variety of techniques including stretch, massage and manipulation and strongly believes in the importance of patient education. Charlotte will interact with clients to establish the right tools and provide guidance to help manage their discomfort and restore function. Charlotte has also trained in Pilates and Western Acupuncture, which have found to be valuable tools within osteopathic treatment.